If you are looking for super-moist, tender turkey breast then it's really hard to beat sous vide turkey. There's a definite art to properly roasting an entire turkey and getting every part to turn out perfectly cooked, and it's something that's always hit or miss for me. Once I switched to sous vide turkey breast, I make awesome turkey every time. And as an added bonus, I don't have to struggle to carve up the turkey in front of my whole family! 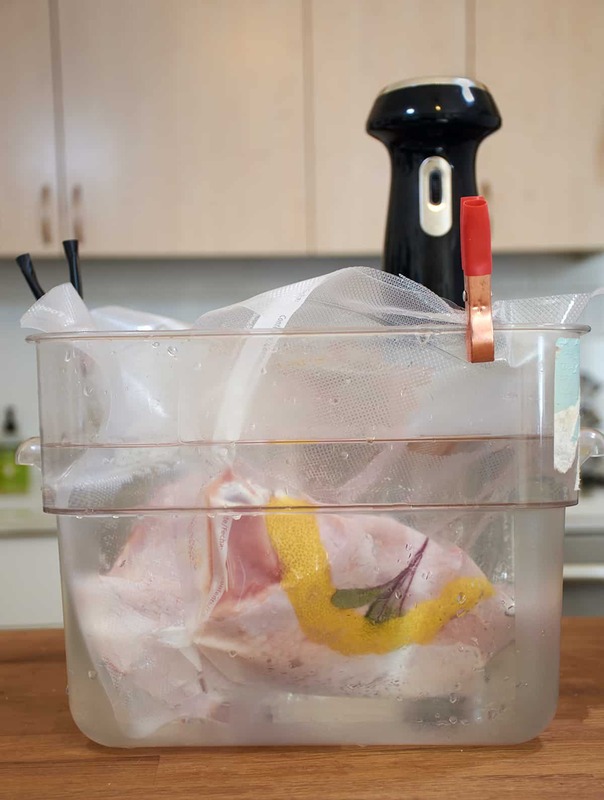 There are several approaches you can take to making sous vide turkey breast but almost all of them start by removing the turkey breast from the turkey. The white meat cooks at a different temperature than the dark meat, so unless you are super-crunched for time it's best to separate them. I generally leave the bones in for added flavor, though if it's easier you can cut the breast off of the bones. If you really love crisp skin, you can remove it from the breast and crisp it up in the oven around serving time. There are several ways to do it but treating it like bacon and using a skillet on medium-heat with a little oil works well. You can also place it on parchment paper on a baking sheet with raised edges, add another layer of parchment paper and then another baking sheet on top and bake it in an oven set to 375°F to 400°F until it's nice and brown, usually around 40 minutes. You have several options for the turkey breast meat itself. My favorite is to cook it at 140°F (60°C) for 4 to 8 hours. Note: For questions about the low temperature, you can reference the sous vide safety and pasteurization section of the Exploring Sous Vide course. From a temperature standpoint, I think 140°F results in the best combination of "moist but cooked" so it's what I often go with. This is doubly true over Thanksgiving when I'm serving friends and family who might want a more "traditional" texture to their turkey. You can find out the minimum time needed for it to be safe from my sous vide thickness times. 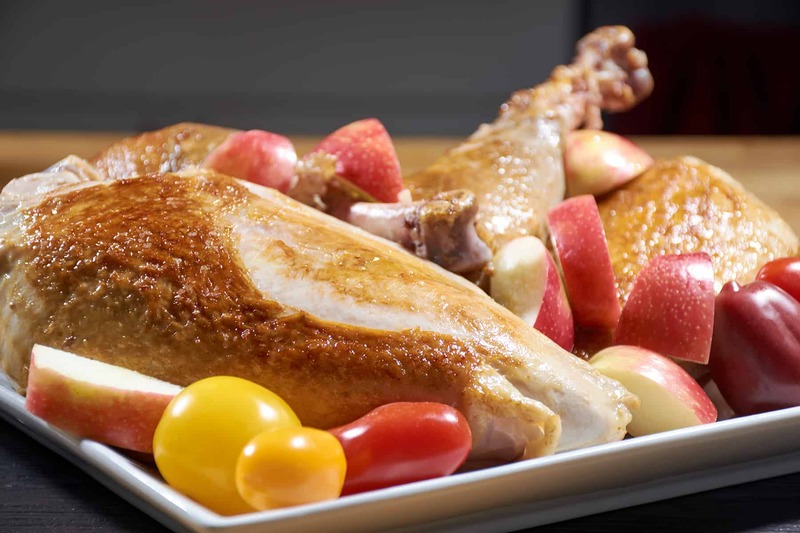 Since turkey meat is tougher than chicken meat it can benefit from some longer cook times. The longer you cook it, the more tender the meat will get and up to 8 hours usually still results in real tender and moist turkey. Some other popular time and temperature combinations are ChefSteps, who recommends 131°F (55°C) for 8 to 14 hours. Some people recommend 145°F up to 150°F (62.7°C to 65.5°C) for a more "traditional" texture, though it will definitely be less moist. I usually like to season my turkey breasts with some salt, lemon peel, and sage. If you like a little sweet turkey you can add some sugar to the bag, or for a more savory take you can use any of your favorite spice rubs. Once the turkey is done cooking, dry it off really well using a dish cloth or paper towels. Then sear it in a hot pan, on the grill, or under the broiler until the skin begins to crisp up. Some people also love to deep fry the chicken once it's done cooking. 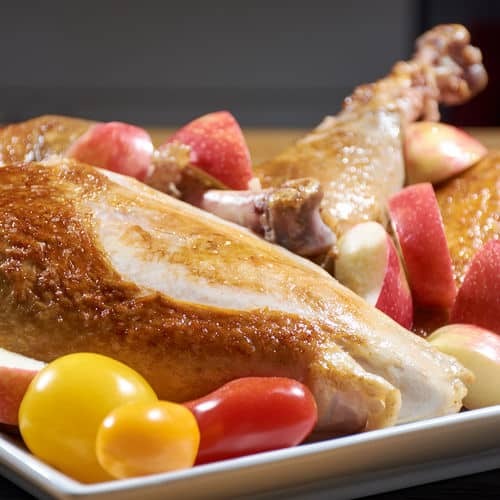 If you would like more information about the modernist techniques, ingredients, and equipment used in the sous vide turkey breast recipe you can check out the following. 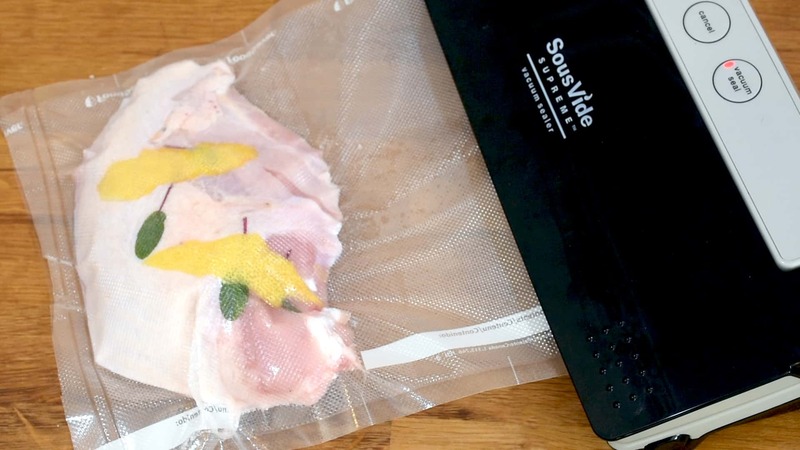 Salt the turkey breasts and add to a sous vide bag. Remove the zest from the lemon, using a vegetable peeler or zester and place into the bag on the turkey breasts. Add the sage leaves to the bag then seal it. Cook the turkey breasts for 4 to 8 hours, or at a minimum, until they are pasteurized. 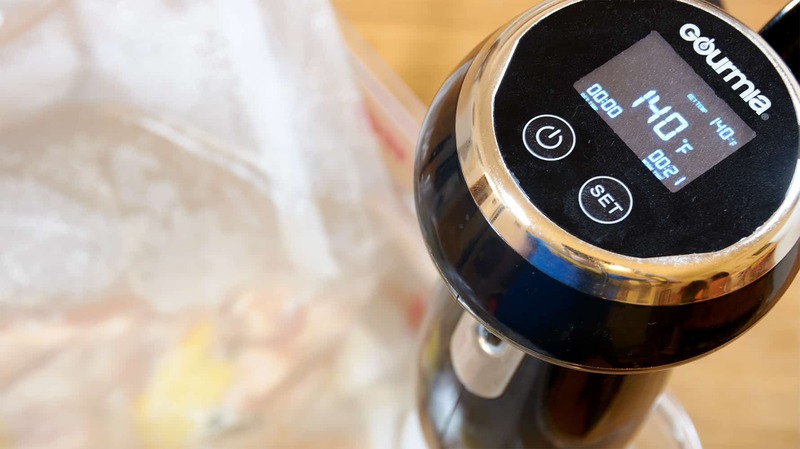 Once cooked, remove the cooked turkey breasts from the sous vide bag and pat dry. Lightly salt the outside then quickly sear them until just browned. You can serve the turkey breasts whole or cut them into slices. This sous vide turkey breast recipe will result in the most tender and moist turkey you've ever had. Plus it frees up your oven for all the sides you'll be making on Thanksgiving!